The Go programming language recently celebrated its fourth birthday and increasing popularity. The language has very few limits when it comes to coding Unix daemons, networking code, parallelized programs, and the like, although it is probably less well-suited for an operating system kernel. The Docker container virtualization project and Ubuntu Juju tool are two examples of projects written in Go. Designed as an heir to the C programming language , Go offers many of its predecessor's strengths, while simplifying syntax and supporting secure programming (e.g., through strong type casting). The Unsafe module makes Go resemble C more closely, although it does compromise security, as the module name suggests. The standard Go library  is extensive, offering many useful system programming modules for data compression, cryptography, binary file formats (ELF, Mach-O), and so forth. 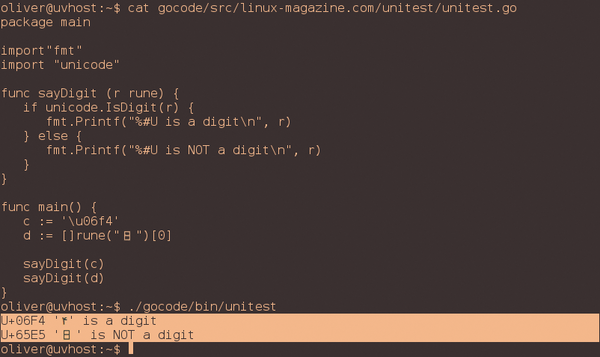 In this article, I will create a simple tool written in Go that has a function similar to the ps process status tool in Linux. Go projects have a somewhat peculiar directory structure. To compile source code files, you must follow a certain procedure, so that the go build and project tool work properly. The GOPATH environment variable specifies the directory in which all Go projects reside. Below that are dist, bin, and src, the latter of which contains the source code under a directory that uniquely identifies a package or project. In principle, this can be any string but is typically your domain name, followed by a project name (e.g., linux-magazine.com/<project>; Figure 1). The go tool also loads projects off the Internet (e.g., from GitHub), which then end up in $GOPATH/src/github.com/<project>. Figure 1: The structure of Go projects: a top-level directory containing directories for binaries and source code projects. If you take a look at the GOPATH/bin directory, you will discover no files there. The go tool only copies the binary to this location if you use the install command; it thus makes sense to do this straight away, instead of detouring via build. Program libraries end up in GOPATH/pkg. The object files can be removed by issuing go clean package; with an additional switch, go clean-f also removes the binaries. The idea behind lap is quite simple. In the /proc filesystem on Linux, a globally visible directory for each running process uses the process ID as the name. Below this are a number of virtual files with information about this process, including the stat and status files, which contain, for example, the parent process ID, the owner, the start time, and so on. The directory contents are returned by a call to the ReadDir function from the ioutil package. To go through all the entries, use the for loop with a range expression that lets you iterate over arrays, slices, strings, maps, and channels. With only one control variable, range assigns this to the array index. Go automatically assigns a second variable to the content of the corresponding array element. The Go compiler only accepts this if you actually do something with the index variable. If you don't, you can use the Go wildcard for variables, _. A proc in this example is of the os.FileInfo type; it implements an interface that includes the call to Name() for reading the file name. Incidentally, the small example program that can be seen in Figure 2 proves that this is not just true of Arabic numerals in the Unicode world but also works for any other numeric systems. Figure 2: The Unicode IsDigit method determines whether a character is a number. This even works with foreign number systems. As you can see, the function returns two values: the content of the file and an error code. This is typical of Go functions and certainly more structured than, for example, returning a null pointer for the content in the case of an error. If you assign the error code to a variable, you also need to process the variable; otherwise, the compiler will in turn generate an error message and refuse to compile the file. If you want to ignore the return value, you can again assign the error code to the wildcard, _. To process the fault, you would typically test whether the err variable is equal to nil. If so, no error has occurred. The /proc/PID/stat file contains only one line in a fixed format, with the individual fields separated by spaces. Unfortunately, the format is not documented anywhere in a useful way, not even in the Linux kernel documentation of procfs . Ultimately, your only resource, if you want to know exactly what is going on, is to take a look at the Linux source code. The PID comes first no matter what (and this is the same as the directory name), then in brackets you have the process name, the process status, and the parent PID.